Nothing says love of goats more than a 1200-mile road trip with two goats in your car – with frequent stops to milk them alongside the road. That’s what Andre Entermann did on his move from Southern California to Lopez Island in 2008. Seven years later, his love of goats is as strong as ever. Andre and Elizabeth Entermann recently opened Sunnyfield Farm, their family-run goat dairy on 40 acres in the center of Lopez Island. I sat down with Andre in his barn earlier this week to hear his story. Originally from Southern California, Andre grew up wanting to be a firefighter. When he was 18 his mom suggested he might like the Coast Guard. That sounded close enough to firefighting, so Andre joined up – eventually becoming a helicopter rescue swimmer and EMT stationed in Savanna, Georgia. If you’ve ever met Andre, you’d probably agree that he doesn’t exactly come across as the military type. His commanding officers likely came to the same conclusion when they saw him on TV protesting the war, or when they noticed him selling hemp grocery bags at the local Saturday market. In 2003, Andre decided it was time for a new chapter. Having saved up his hazard pay from his years in the Coast Guard, he moved halfway across the world and spent two years hitchhiking his away around Australia in search of indigenous cultures and primitive, more sustainable lifestyles. 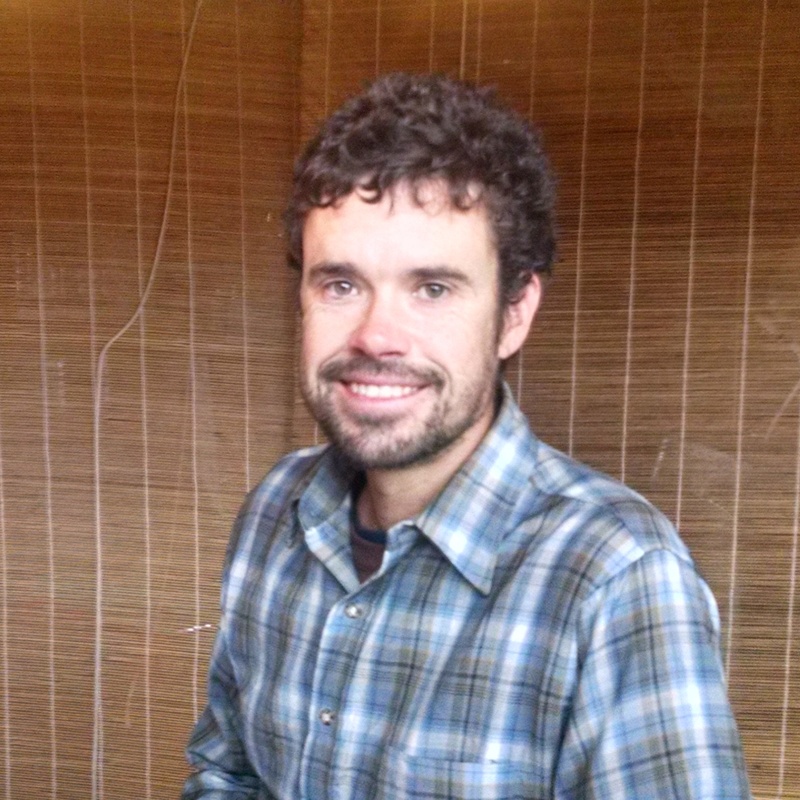 In 2005, after quite a personal transformation, Andre’s parents, who lived in Anacortes, suggested he pay a visit to Lopez – thinking that the island’s community and lifestyle might suit him. It clearly did. His first day on Lopez, Andre wandered into Blossom Grocery, where someone suggested he introduce himself to Ken Akopiantz at Horse Drawn Farm. So he did, and landed himself a job immediately. That might have been when Andre first started thinking seriously about starting a goat dairy. But the timing wasn’t quite right; so he headed back to Southern California for a few years, where he ended up buying the two goats that accompanied him on the car ride back to Lopez in 2008. Back on Lopez, Andre returned to Horse Drawn where he got an apprenticeship. His transformation continued. Andre learned a lot about farming. He became a father. And, in 2011, he met Elizabeth Metcalf, who shared his love of goats and dream of owning a goat dairy. Elizabeth had moved to Lopez as a child when her parents did a straight trade: their Victorian home in Seattle’s Queen Anne neighborhood for a 40-acre farm on Lopez; which Elizabeth’s dad, Ron Metcalf, later named Sunnyfield Farm. In the winter of 2012/2013, the WSU Extension advertised for a several-month-long workshop in Friday Harbor on how to start a dairy. So, Andre and Elizabeth spent one weekend a month in Friday Harbor learning every conceivable detail about running a goat dairy – everything from what to feed them in order to produce the best-tasting milk, to how to prevent the goats from pooping in their food. They also visited countless farms around the region to learn from people who had been farming for years. The workshop provided a goat dairy blueprint. To this day, Andre and Elizabeth regularly refer to their massive how-to-run-a-dairy instructional binder. 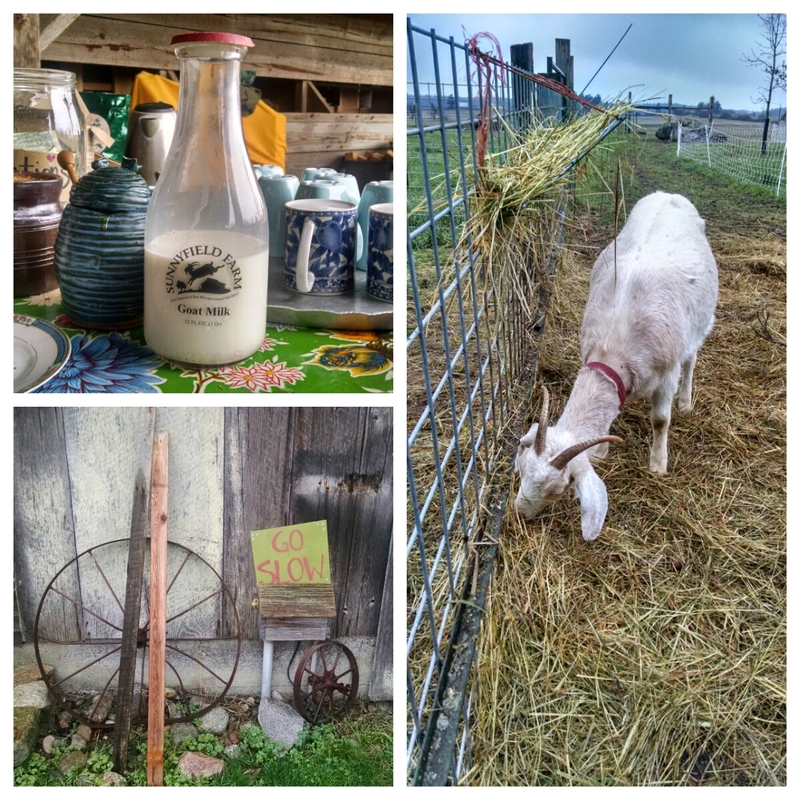 In November of 2014, Andre’s and Elizabeth’s dream was finally realized: the Washington State Department of Agriculture granted Sunnyfield Farm a license to sell raw goat milk, aged cheese and pasteurized cheese. The Metcalf’s farm was perfectly set up for such an operation, having originally been a cow dairy in the 1930s – complete with barn, milking stalls and several outbuildings for processing and aging cheese. Sunnyfield Farm is quite a sight to behold. You get a sense of how farming used to be about 100 years ago. The goats have free reign across most of the farm’s forty acres, which is bordered not by fences, but instead by natural barriers like hedgerows and trees. Currently, Sunnyfield is home to ten goats, which produce about eight gallons of milk a day, collectively. A portion of that is sold as raw milk; the rest is made into cheese. Andre and Elizabeth are very much into permaculture. Most of the goats’ food comes straight from the land, supplemented by alfalfa that comes from Whidbey and eastern Washington. Though Sunnyfield very much seems to have its act together, Andre admits that “it’s really one giant experiment.” That experiment seems to be going well. What Andre and Elizabeth have created with Sunnyfield Farm is pretty amazing. Their vision, though, transcends farming. They are gradually turning Sunnyfield into a community hub. 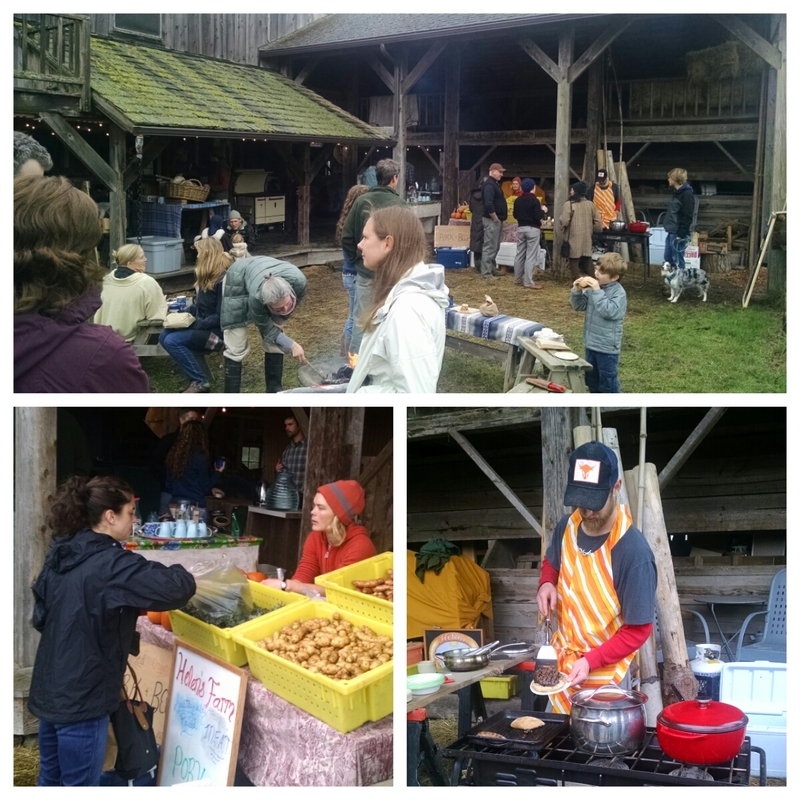 Every other Saturday they host the Little Winter Market, a small farmer’s market in the back of their barn where you can sample and buy cheese and milk from Sunnyfield, pastries and bread from Barn Owl Bakery, and meat and vegetables from Helen’s Farm. My family has gone the past two Saturdays – thoroughly enjoying both the delicious local food and the gathering of Lopezians, many of whom are becoming our friends. If you haven’t tasted Sunnyfield Farm’s cheese and milk, you have to check it out. For now, you can buy it directly at the Little Winter Market. Eventually, you’ll probably find it at Blossom, the Summer Lopez Farmer’s Market in Lopez Village, and maybe even the Farmer’s Market on Orcas. Check the LopezRocks calendar to see when the next Little Winter Market will be held. Who would not want to be a Lopezian??!! What a wonderful community?!? !